At present one of the key issues in the chemistry field is the development of so called "green" technologies that aims to preserve the environment and to reduce the negative influence of human involvement. Among the diverse ways of “green” technology, developing and applying “green” solvents are one of the most important subjects. Recently, a new type of “green” solvents, named deep eutectic solvents (DESs), was developed. DES is a mixture of proton acceptor and a proton donor in solid state, which are joined by intermolecular hydrogen bonds. The resulting mixture is eutectic, i.e. it has a lower melting point than that of any of its individual components and it is liquid even at very low temperatures. In a particular combination and ratio natural compounds in solid state (primary metabolites) may also be converted into liquids to form so called natural deep eutectic solvents (NADESs), which are present in nature. They are biocompatible and play a role in all kinds of cellular processes of living organisms. NADESs have several advantages as solvents: easy and inexpensive preparation, biodegradability and in addition, the precursors used for their production are natural, non-toxic, renewable compounds, which are abundant in our daily foods. It was found that NADESs have a number of interesting applications in electrochemistry, functional materials, organic synthesis, catalytic transformations and pretreatment processes. Recently, the interest in NADESs increases due to their successful application in the extraction of bioactive plant metabolites, including non-water soluble. Besides, the extracted compounds can be easily recovered from NADES. This predicts a great potential for NADESs as solvents in the extraction processes of valuable secondary metabolites, further implemented in the food or pharmaceutical industry. Still the most effective and widely used way for exhaustively extraction of all biologically active components from poplar type propolis, is extraction with 70% ethanol in water. The use of alcohol, however, limits the application of propolis as it is contraindicated in a number of diseases, in young children and pregnant women. In order to protect both human health and the environment it is necessary to seek alternative ways of extraction of this valuable biologically active complex. Therefore the present study aims to apply for the first time a new approach for extraction of biologically active compounds from poplar type propolis based on the use of NADESs and to evaluate their extraction efficiency. Acknowledgment: The financial support of the National Science Fund of Bulgaria, project DN19/4, is gratefully acknowledged. ISNAD PETKOV, Hristo , TRUSHEVA, Boryana , POPOVA, Milena , BANKOVA, Vassya . "Application of Natural Deep Eutectic Solvents for Green Extraction of Bioactive Compounds from Poplar Propolis: A Preliminary Study". 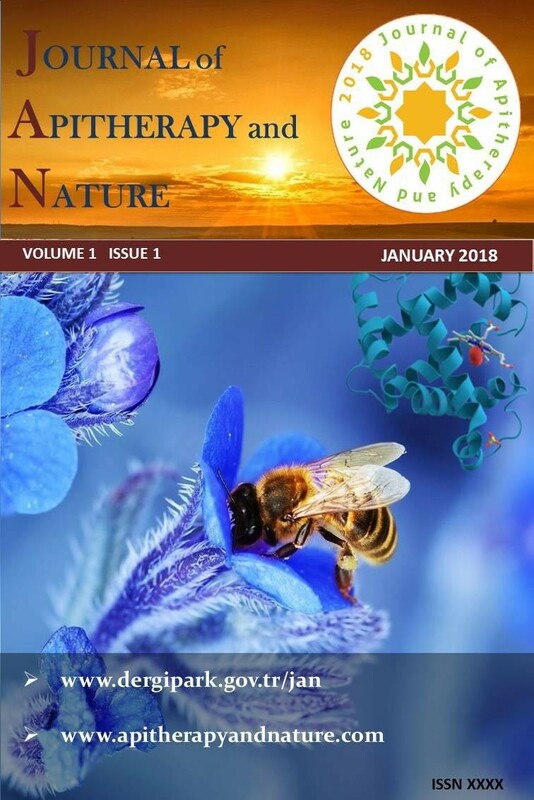 Journal of Apitherapy and Nature 1 / 3 (December 2018): 76-76.